Rose Osatchuk passed away on May 25, 2017, at the age of 93 years. Rose was born to Pauline and George Salahub on September 12, 1923, one of seven children. She grew up on a farm in the Adamiwka district, east of Rosthern. She was married to John D. Osatchuk in 1943 and moved to his family farm in the Nichlava district. They were blessed with three children, Mary, Robert and Frances. They raised their family and farmed for many years. Rose was active in the St. Mary’s and later the St. Peter & Paul Church Women’s Group as well as the Nichlava School activities. Due to failing health, they moved their home from the farm to Rosthern in 1971. 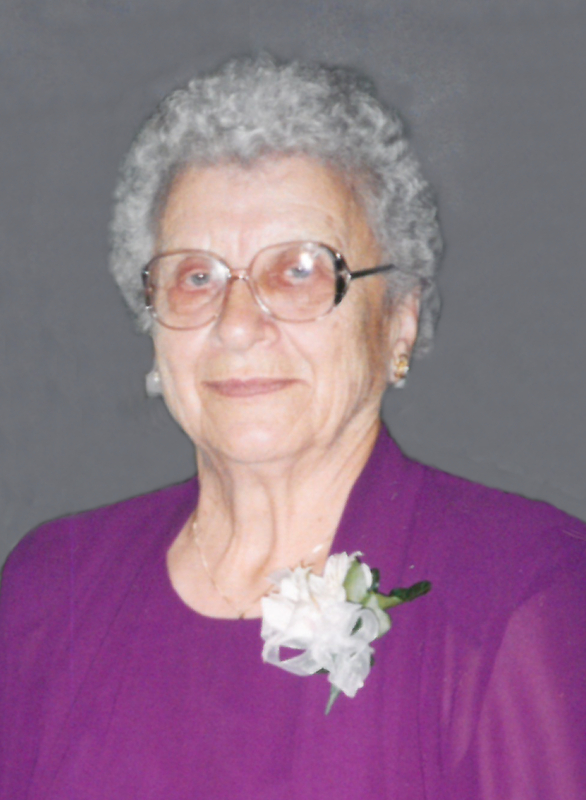 Rose obtained a housekeeping position at the Rosthern Union Hospital and worked there for fifteen years. Rose was very proud of her Ukrainian heritage and faith. Rose was predeceased by her: parents Pauline and George Salahub, husband John, brothers Nick, Peter and Steve, sisters Mary Zazula and Olga Kuzyk, as well as numerous brothers/sisters-in-law, relatives and friends. Left to mourn her passing are her children Mary (Ervine) Bayda, Robert (Sylvia) Osatchuk and Frances (Keith) Burnham. Much loved and role model to grandchildren Geraldine (James) Beingessner, Joanne (Darwin) Hagel, Jason (Charmaine) Bayda, Cory Osatchuk, Quinton (Leslie) Osatchuk, Avery (Kathy) Burnham and Allison (Andrew) Morris. Her greatest blessings were her great-grandchildren: Kayla, Levi and Nikki Beingessner, Nicole Chubak, Brenden, Klae and Taelor Bayda, Jake Hagel, Abigail Beallie-Osatchuk and Stella Burnham. She is also survived by her only remaining sibling, Nellie (Maurice) Burlack, numerous nieces, nephews and friends. The family would like to thank the Sisters and staff at the St. Joseph’s Nursing Home in Saskatoon for their excellent care and daily inspiration. The Prayers will be held on Sunday, May 28, 2017, at 7:00 P.M. The Funeral Liturgy will be celebrated by Rev. Fr. Mykola Romanets on Monday, May 29, 2017, at 10:30 A.M. Both services will be held at the St. Peter and Paul Ukrainian Catholic Church, Rosthern, SK. Interment to follow at the Rosthern Ukrainian Catholic Cemetery. Always in our thoughts – forever in our hearts. Vichnaya Pamyat. Arrangements are in care of Funk’s Funeral Home, Rosthern, SK (306-232-5245, http://www.funksfuneralhome.ca).